Living in Florida there is one thing that is certain, you are never far from a beach. Pick nearly any Saturday and you will see a comical display of families hauling coolers, chairs, and assorted toys to the beach. 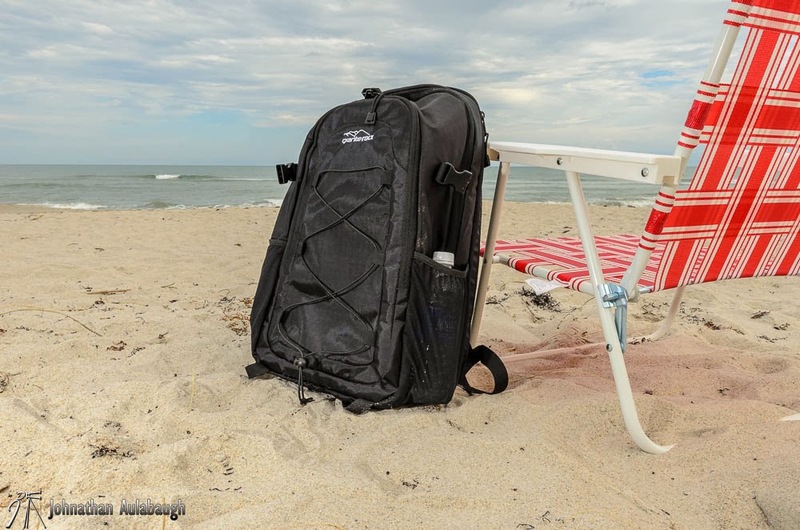 One company has an answer to make days to the beach easier. 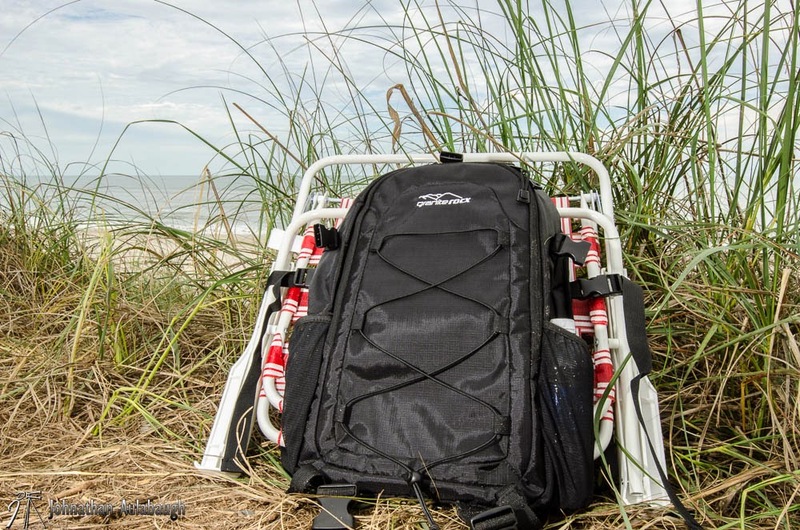 Granite Rocx has created a backpack that carries a chair, has an attached cooler, and can fit a day's worth of munchies perfect for the beach. I received the Tahoe and was intrigued as to the design. Behind the shoulder straps is the first set of zippers that open the area for a folding chair. The chair is latched on and clipped and the straps are tightened to keep the chair secure. Beyond that is a large compartment that will hold any snacks or valuables you may need for the day. A small cooler that attaches to the pack sits beyond that. The pack is actually built on a fairly standard basis. YKK style zippers, plastic snap buckles, and nylon webbing for straps. The pack also has 2 mesh pockets on either side as well as a bungee strap web on the front of the pack to secure wet towels etc. So what do I like about this pack? The idea behind it is great. The cooler attaching to the pack is awesome. I actually used the cooler separately more than I did the backpack. I could put an ice pack in the cooler with a few drinks and have enough for most of the day. The size of the backpack is fairly standard which really means there is enough for towels, munchies, and assorted gear. It also has a second compartment that can hold valuables like a wallet, phone, keys etc so that they are close to hand. 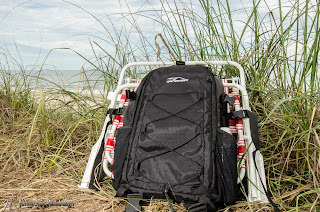 The straps under the pack are great for latching on other styles of chairs as well. The shoulder straps are padded so if you're carrying in "beach attire" the shoulder straps will be nice and comfortable. What's not so great? I will start with my favorite part and that was the cooler. It is a cool feature but I would have liked to see a water tight system in case I wanted to use ice instead of an ice pack which takes quite a bit of room for anything that would last more than a few hours. A padded waste belt would be nice as well but not a product killer. Another thing with this product is that it is not designed for the larger person. The waist belt is slightly on the small side if your above average in the weight dept. 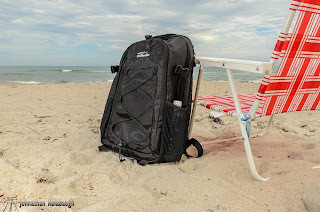 The Granite Rocx Tahoe backpack is imaginative in one sense and could be improved in another. For short walks to the beach it would be nice. If you need to have both hands free to get to a location it would also be nice. In my opinion, the product is not perfect but it is a good idea and I see a great future for this company if they keep the innovation going. Disclosure of Material Connection: I received the Granite Rocx Tahoe for free from Granite Rocx as coordinated by Deep Creek PR, an Outdoor Industry Public Relations Company, in consideration for review publication.